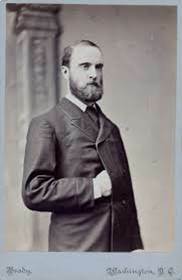 Born in 1846, Charles Stewart Parnell was one of the most significant Irish, if not British, politicians of the latter half of the 19th century. Coming from a wealthy Anglo-Irish landowning family with parents who were strong Irish nationalists, he entered politics in his late 20s, partly prompted by the execution of three Fenians in 1874. He was elected to Parliament as a Home Rule League candidate in 1875. While never formally associated with the Fenians – the Irish Republican Brotherhood (IRB) – his radical inclinations were clear and he developed close links with many nationalist leaders, notably Michael Davitt. Parnell became the President of Davitt’s Irish National Land League just after its formation in late 1879. His long-term target was the the ownership by Irish farmers of their land. Both he and Davitt traveled extensively in the US in 1879-1880 raising funds for the League. Both men were arrested and jailed in Ireland under the Coercion Act of 1881 and imprisoned in late 1881, at which point the Land League was suppressed. Parnell was released in March 1882 after agreeing with the British Prime Minister, Gladstone, to the Kilmainham Treaty. By now the political differences between Davitt and Parnell (and their respective supporters) became more noticeable than their commonalities. Parnell sought to find a way through the mainstream of parliamentary and constitutional politics and came to terms with a British government seeking to find a compromise. Home Rule rather than land became his focus and, in December 1882, an Irish National Land League was created to replace the Irish Land League. Meanwhile Davitt, a supporter of Henry George, moved towards the issue of land nationalization. The changes in focus through 1882 meant that the American branch of the Land League rapidly lost its impetus and much of its radical support in the US, including that of Patrick Ford and his Irish World who stopped acting as a fundraiser in late 1882. Parnell spent the next decade, with some success, centred on Home Rule and Westminster politics, but after a scandal in the late 1880s, lost his leadership position and died in 1891. This entry was posted in People and tagged Davitt, Henry George, Irish World, Land League, Patrick Ford. Bookmark the permalink.